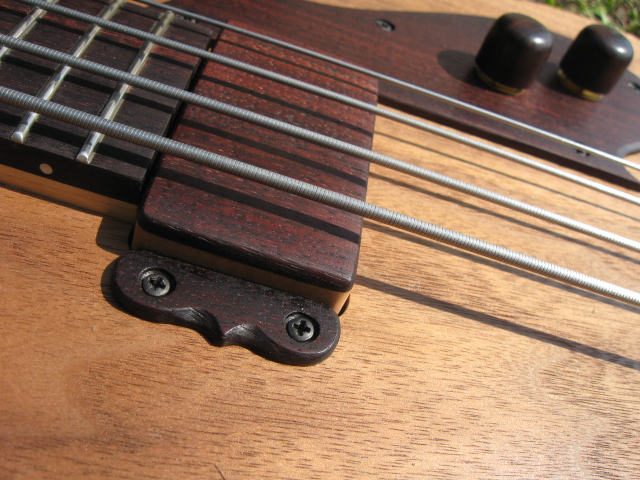 Simply put - a shorter bass with less reach and the frets a little bit closer together. Great for anyone wanting a more comfortable, better balanced bass. What WE do is design them so they keep the BIG bass tone, and hand build them in Texas! For size comparison, here are (left to right) - Fender P (34" FULL long scale) with our 31” scale Cbass; another Fender with our Fusion bass (body comparison); headstock and reach comparison, our 1st fret is about the reach to a full scale bass’ 3rd fret; and the comparison is the same for our 31” scale 5 string vs. a full size 5. "A Birdsong, by design, is not just one of the best short scales in the world - but a world class bass that happens to be smaller, lighter, and more balanced & comfortable." "Never had to tune it once during the entire 2-hour straight set (and we were outside in 100 degree temperatures)! Thanks Scott Beckwith, you design and make some awesome instruments!" 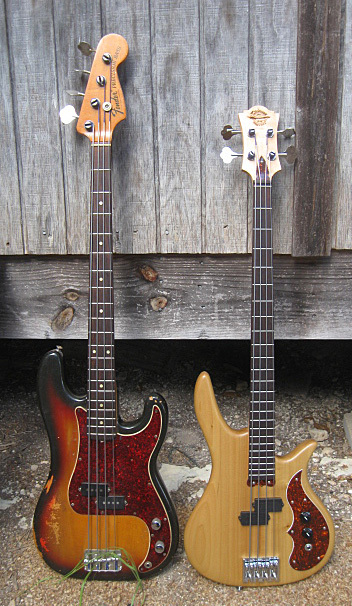 Birdsong Guitars formalized & opened shop in 2004 after searching for an instrument that couldn't be found - a shorter, lighter, better balanced, easier playing bass guitar with a full size tone and hand built to professional standards, with none of the issues of the "old classics" or other short scale basses. Scott Beckwith built his first original design in 1997, ultimately coming up with the ingredients for a really great little bass, the Cortobass. We built a company around it. The Wingfeather Workshop menu grew to build other instruments such as lap steels, Scott's side projects, and to bring back the SD Curlee name. Literally a Mom & Pop business started by Scott and his wife Jamie, 15 years later in 2019 Birdsong is still the flagship of all we do. Our instruments - your instruments - are still "craft brewed" on small workshop benches, to high quality boutique standards, with care and devotion to detail. Though our basses are played worldwide by players of all shapes & styles, and we now have one for just about everybody, our way hasn't changed. We make instruments in a small workshop - it's who we are and it's what we do. The Texas "Hill Country" is beautiful - maybe we can send you a little piece of it. For additional information on Birdsong Guitars, please read through the Info page. Money back satisfaction guarantee - even on custom orders! Short 31" scale for less reach and easy fretting - comfy 24 fret neck. LEFTY builds NO EXTRA CHARGE! Anything we make. SIDE DOTS ARE THERE - small face dots are optional. Balanced & light weight - 7 to 8 pounds - some even closer to 6! Warm passive tones, incredibly big sounding. These are REAL basses. Pro-quality parts throughout, beautiful hand-rubbed oil natural finish. Prices include hard shell case or high quality padded gig bag. SHIPPING INCLUDED fully insured to your door (CON-US ONLY) directly from our workshop. Shown: Spanish cedar with matching headstock (150), wood control plate instead of standard matte black (100), black hardware (50). A variation on the Cortobass theme that instantly became one of our best sellers! Rear routed controls and twin soapbar pickups in more of a J-style position give the "2" a sleek look and clear, more modern tone. Think "J" but more powerful and no pickup hum. And of course much smaller & more comfortable! Shown: Spanish cedar with rosewood fretboard, matching headstock (150), black hardware (50). 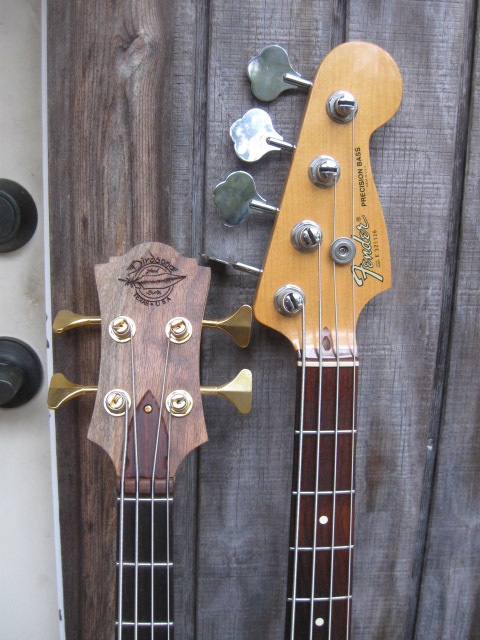 Here's the Cbass demo video with it and the old Pbass. "I've been meaning to write a testimonial for awhile now, but just haven't been able to put down this beautiful instrument long enough to do so. It's nearly impossible to fully put into words just how pleased I am, but I'll try. My other basses have all been collecting dust lately; this bass really can "do it all". Even though the EQ is passive, I've never seen a passive one that has so much tonal range. You can easily get the "BITE" of a pick-like attack, even with your fingers; or smooth background textures that just blend in. You mentioned to me the care with which you made the decision of just where to place that P-Bass pickup, and it's just where it needs to be. PERFECTLY balanced, ya couldn't ask for better. SO easy to play. I'm torn between keeping her all to myself, or letting other folks play her, so I'm kinda possessive about letting another player touch her. On the other hand, I wanna "spread the word" about how wonderful Birdsong basses are, so I've let a few folks noodle around. They all comment about how low the action is, and how easy to play. Among others, I've owned a Fender P-Bass & Jazz Bass, a Rickenbacker, and Spector Basses; including a Euro 4 (retails for around $3500). Also two short-scale vintage Gibsons (a '68 EB0 and a '69 EB3) This Birdsong bass is, by FAR, the most comfortable to play, and has the widest tonal range of any bass I've ever had." ~Larry W.
"It's been three or four weeks... I just wanted to let you know how psyched I am about this bass. I don't even think I'll ever look at another P BASS again." ~Miguel G.
"Cbass arrived today safe and sound! Everything about the instrument, from the feel, to the look, to the SOUND has exceeded my expectations!" ~Chris M.
"Had a few days to play and feel and evaluate this thing. I think you’ve created the perfect instrument. Holy crap. I’m in love with it. The sound is everything I’ve been searching for, for many years. Better, far better than any Fender I’ve ever heard or played. Perfect." ~Dan R.
With a fresh infusion of Birdsong comfort, build quality, and attention to detail, we pay homage to an old friend with all the vibe, none of the quirks, and twice the tone. Thinner mahogany body with carved edge, mahogany stained maple neck with rosewood board, black/white/black plates, numbered knobs, chrome or black (+50) hardware. CLICK HERE FOR DEMO VIDEO! A Birdsong Hy5 5-string is a miracle bass of sorts, mostly because people will still tell you "It can't exist..." but it does. Really it's nothing more than the Birdsong 4-string recipe for a BIG sounding, resonant short scale bass expanded and tweaked for 5. Our exclusive B stringing and careful voicing results in a compact, easy playing, balanced short scale 5 that feels small, sounds huge, and behaves about like a good 34" scale. It's a little giant, the truth comes out of the speakers, and money back if you're not blown away! Here is a demo video of the 5-string from a few years ago. In the line since 2007, for 2018 our standard 5 string model is based off of a slightly redrawn Cortobass body (to fit visually AND balance the 5-string neck). In 2017 we made a custom order of one and it felt SO right we pulled templates, took measurements, and... here you are! The Corto5. Shown: Alder body with rosewood fretboard, rosewood stringer (100), black hardware (50), and an example of a single pickup version. Scott's favorite Birdsong, the Fusion was designed as a classy jazzy blues bass with an almost upright tone. It can rock too - Tommy from My Morning Jacked toured with one - and is great for backing up acoustic players. Elegance, warmth and articulation... it sounds just like it looks. *Fusions come in walnut with black hardware standard, trimmed in hand carved rosewood. Slap yourself silly on this Cortobass variation with the HUGE sounding (and beautiful) Delano humbucker, or just dig in and shake the walls. VERY refined and has a tremendous high fidelity frequency range for such a powerful pickup, you can roll the volume back a little and the tone control a lot and play reggae with it. Incredibly versatile with lots of options for your build, but poplar is a very good body wood for this recipe. $2400 w/case & shipping Here's a demo video! Mix & match present & past body shapes, pickup arrangements & features to come up with your own model! Sadhana, Talisman, Bliss, and more - all here as starting points. Let's talk on the phone and work up a dream bass for you, you probably deserve it! Top row for additional body shapes: Sadhana, Talisman, Bliss, Skyrider, Odyssey, Original Hy5. Bottom row for wood ideas: rustic pecan, stringers & pinstripes, scroll and maybe two necks, 5 pc. with German carve edge, contrasting wings, and hey - why knot? Custom orders start at $2750 w/case and shipping. And they can climb... but we love making dreams happen as inspirational tools, so give a call and we'll talk about it. Like any Birdsong, we promise your satisfaction - you love it or you send it back, even custom orders! Our return rate is under 1% since 2004 though, so clear it a spot in the music room. Playable works of southwestern art, this can be applied to any of our models of guitar or bass. We build with native Texas mesquite, fill the voids & natural character with real turquoise, and "full dress" it out with hand engraved solid silver plates by the world renown Clint Orms Silversmiths. Artist builds are the very high end of what we do. Time & money; they take a lot. But if you like what we do and are thinking of an heirloom quality piece you can display but also play, maybe it's time to mark a chapter in life and we'd be honored to craft you something very special ~ full of symbolism, meaning, and above all... Birdsong tone & playability. As pretty as they are, they're our same great instruments underneath all the exotic woods and inlays! Call us anytime with questions, thoughts, or dreams. This is what we’re here for. 512-395-5126.